Simmer all ingredients, except scallops for about 3 minutes. Add the scallops and bring to a simmer for just about 5 seconds. Remove scallops with a slotted spoon. Boil the liquid down to one cup. Cook the butter and flour together for 2 minutes. Do not let it brown. Take the pan off the heat and whisk in the poaching liquid and the cream. Season with salt and pepper. If the sauce is really too thick, add a few drops of milk. 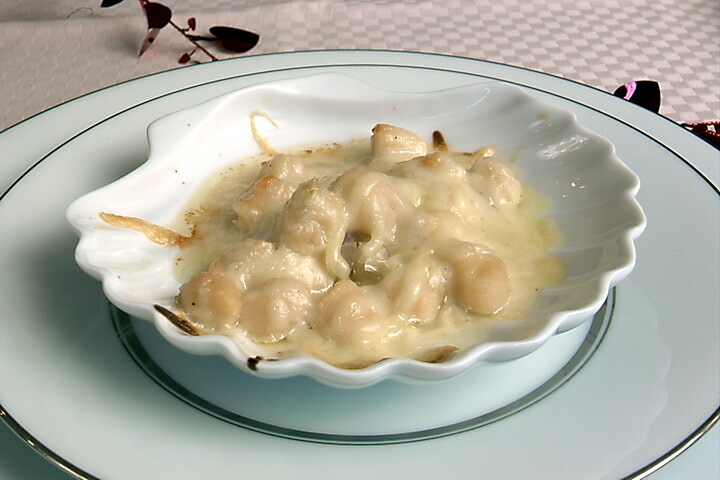 Place scallops in a serving dish (individual or one large) and put enough sauce on top, just to “enrobe” them. Sprinkle cheese on top. You can make this up to this point and put the scallops in the refrigerator and remove just before you want to serve. Then, put the scallops under the broiler and keep an eye on them. Just let the cheese melt and the very slightly brown. Then, dig in and lap them up! Preheat oven to 350 degrees. Cut off all but 1 inch of the carrot tops, leaving a little green. Put carrots in a large shallow pan, add oil, and season with salt and pepper. Turn to coat carrots. Put them in the oven and roast for 30 minutes or until tender. Melt butter in a skillet over medium heat. Cook butter until it becomes brown, keep swirling it in the pan, don’t walk away. Squeeze in the juice from the orange halves, add brown sugar and sage , and continue to cook for 2 minutes until thick and syrupy. 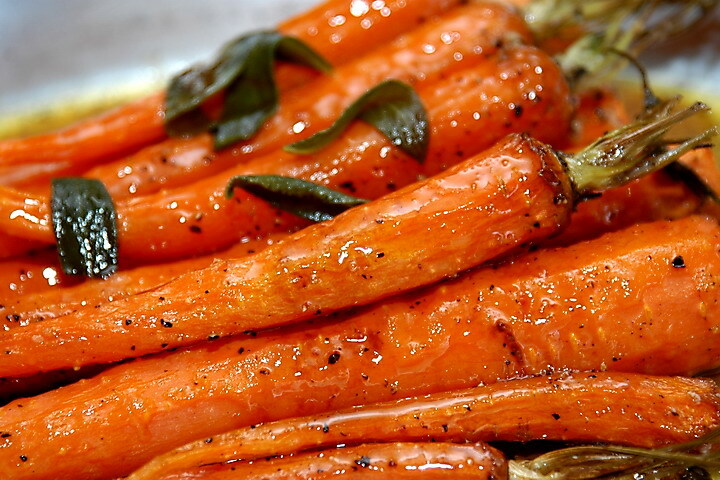 Remove carrots from oven when done and arrange them on a platter. Drizzle the orange butter over the carrot and serve. Brown beef in pan with 2 tbsp butter. Saute until all the liquid is evaporated. Cool to room temp. 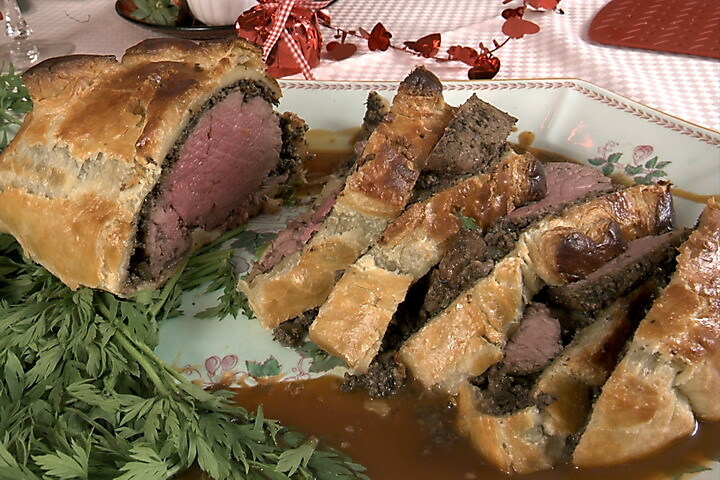 Using 1 package of frozen puff pastry – thawed – on a floured surface, roll out to a sheet big enough (eyeball it) to encase the beef. Using an egg wash (1 egg whipped with a tsp of water), brush wash all around the edges of the puff pastry to use as glue,. Once encased, brush eggwash all over outside of the puff pastry. Make any designs you wish and brush those, too. Put into a 425 degree oven – again for about 20 minutes. My meat thermometer actually read 121 degrees when I removed it. Let sit at room temp for about 15-20 minutes before cutting. Slowly add the red wine and broth and garlic and whisk to combine. Reduce over medium heat until slightly thickened. Heat oven to 350. Oven should be at this temperature for at least 10 minutes. Pour cream into a 6-cup saucepan, stir in vanilla extract and orange zest, and bring to simmer. Remove from heat, cover, and steep for 5 minutes. Whisk egg yolks and sugar in a mixing bowl for several minutes until the yolks are thick, pale yellow, and form a slowly dissolving ribbon when dropped from whisk back into the bowl. Slowly, by dribbles, so as not to scramble the egg mixture, add half a cup of hot cream into the yolks, stirring (not beating — you donu2019t want bubbles.) Add remaining cream in a slow stream, stirring. Set a fine sieve over a bowl large enough to hold all of the mixture, and strain the custard mixture through it to eliminated any bits of egg and orange zest. Skim off any bubbles. Arrange 8 ramekins in a baking dish large enough to accommodate all of them. The baking dish should have, at least, 2u201d deep sides. Pour, or ladle, 1/2 cut of custard into each, leaving Â¼ u201c at the top for the glaze. Set baking pan in the oven and pour in enough hot water around the ramekins to come halfway up the ramekins. Loosen the brown sugar if packed and break up lumps with your fingers. Sprinkle a tablespoon or so over each custard and smooth it gently with the back of a spoon, forming an even layer of sugar that completely covers the surface. Ignite the torch and point the flame downward over the ramekins keeping flame about 8u201d above the sugar. Move flame over sugar constantly until sugar melts about 10 seconds, depending on the power of the torch. When all of the custards have been crusted, wait a few seconds to harden, then serve. For broiler method: set prepared ramekins on cookie sheet. Turn on broiler. Set ramekins under broiler about 5u201d from the heat. Leave oven door open so you can watch sugar melting and begin to caramelize. Turn sheet around, if necessary, to caramelize evenly. 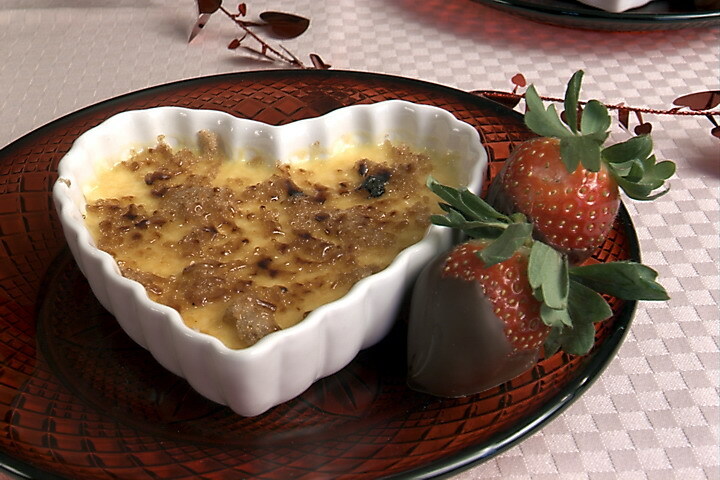 Remove ramekins as soon as brown sugar has turned a smooth sheet of brown glaze. Pre heat oven to 400 degrees. Line a large baking pan with foil for easy clean up. The pan should be large enough to accomodate all of th chicken pieces without crowding them. Wash chicken and pat dry. Place chicken in prepared pan and salt and pepper each piece. 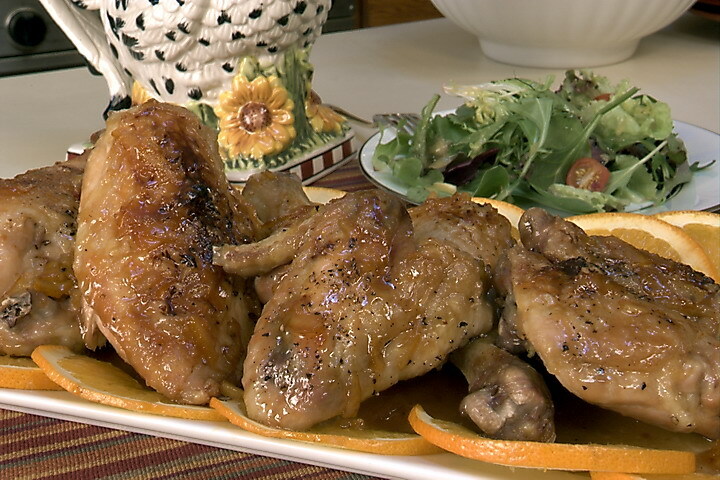 Place in preheated oven for 30-40 minutes, depending on the sizes of the chicken pieces. Mix all of the glaze ingredients in a bowl. After chicken has cooked, test for doneness by piercing the meat with a knife. If the kife can be inserted easily and the juices of the chicken run clear, it’s done. Spoon glaze evenly over the chicken pieces and continue to cook another 10-15 minutes until glaze has nicely browned. 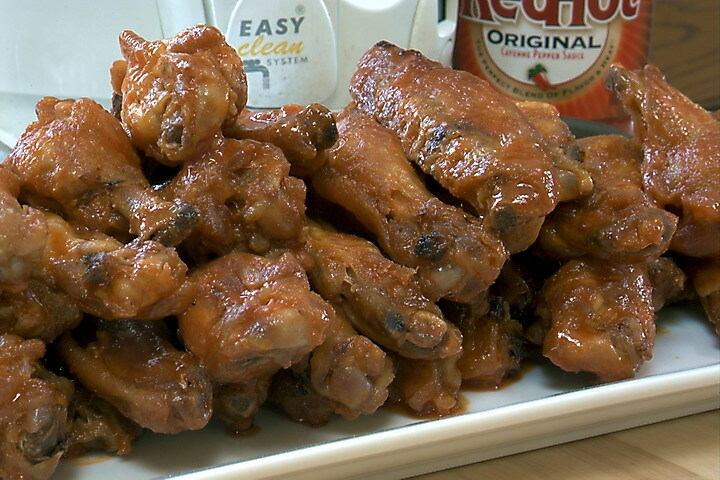 In a deep fat fryer or large frying pan at 375 degrees, using canola oil, fry chicken wings until crispy, about 20 minutes. Take a half bottle of Frank’s Hot Sauce (found in the condiment aisle of your supermarket) and heat it with 1/2 stick of butter. Pour over drained wings, toss to coat and enjoy! Mix well. Pour over wings and toss to coat. Cover and marinate 4 hours or overnight. Put wings in a foil-lined pan. Bake at 325 degrees for about 1 hour. Turn wings over after 30 minutes to make sure they are browned on both sides. In a large casserole, melt the butter and add the flour. Cook gently, stirring constantly for about 5 minutes until smooth. Increase heat and when the mixture foams, add the broth, stirring constantly until the sauce is smooth and thick. To the sauce, add the remaining ingredients: chicken thighs, chopped onions, celery, sugar, salt, pepper, dried sage, bay leaves, minced garlic, chopped chives. Cover and bake in a 350 degree oven for about 40 minutes. Remove from oven and add 1 10 oz pkg of frozen peas. In a bowl, combine 1 cup flour, 2 tsp baking powder and 1/2 tsp salt. In another bowl, combine 1 beaten egg, 1/3 cup whole milk and 2 tbs shortening melted. Combine the 2 mixtures and add 1/2 tsp poultry seasoning and some chives. Mix to blend. 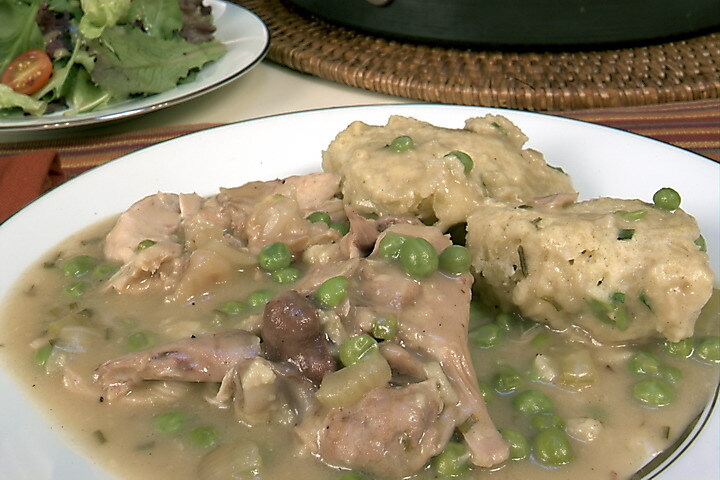 Drop “plops” of the dough onto the chicken and gravy mixture. Cover and put back in the oven for another 20 minutes – do not remove cover during this time! Mix yeast, sugar and water in a large bowl. Add 1/2 cup flour, mix, and let sit 10 minutes. Gradually add flour to liquid, mixing thoroughly, (before the last of the flour add salt) until dough pulls away from sides of the bowl. Turn the dough out onto a lightly floured surface. Fold the far edge of dough back over on itself towards you. Press into the dough with the heels of your hands and push away. After each push, rotate the dough 90 degrees. Repeat this process in a rhythmic motion. This may take 10-15 minutes until dough becomes smooth and bouncy. When dough is pressed with thumb, the imprint should spring back quickly. Scrap out bowl and spray with buttered pan spray, or butter bowl. Return dough to bowl. Spray or butter top of dough and place plastic wrap on dough to cover. Let rise in warm, draft-free place. The oven with itâ€™s light on is a good place. Let rise 1 – 2 hours until double in bulk. Punch dough down with your fist and turn out onto a lightly floured surface. Briefly knead out any air bubbles. Cut the dough in half and shape: Flatten dough in a circle with your hands. Place your thumb approximately 1/3 down from the far edge. Pull far edge over thumb, and with the free hand turned on side, firmly press that edge into the dough. Remove your thumb and repeat 2 more times. Roll dough to have seam on bottom and tuck in both ends firmly. Place in buttered loaf pan. Repeat with remaining dough. Cover dough with buttered plastic wrap. Let dough rise in warm place for 25 minutes to 1 hour. Heat oven to 400 degrees. Oven should have reached this temperature at least 10 minutes before you place loaves in it. Brush tops of loaves with melted butter, if desired. 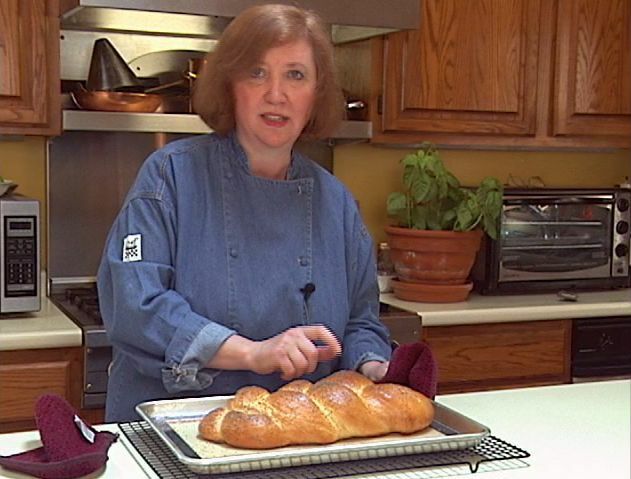 Bake for 25 – 40 minutes until the crust is golden brown and loaf sounds hollow when tapped on the bottom. Shape bread dough into a long rectangle about 1/2 inch thick. Should be about 40″ long and 8″ wide. Along middle of dough, lay out the ham, eggs, cheese, and basil. Drizzle with olive oil and season with salt and pepper. Pull the dough over the filling so it forms what looks like a cannelloni shape. Bring one end around to the other to join them up into a circle. Pinch the two ends together firmly. You now have a wreath or donut shape filled dough. Transfer to a flour dusted baking pan and allow to rise for 15 minutes. Place in preheated oven at 350 degrees for 35 minutes or until golden. Allow to cool and cut into nice slices. Note: You may add other fillings depending on what you like such as olives, sun dried tomatoes, different herbs and spices. Use your imagination! Mix the yeast, 2 tsps sugar and tbsps flour in a small bowl. Add 3/4 cup warm water. Set aside until it doubles in bulk. Turn dough onto a work surface and knead, sprinkling with flour as needed to keep it from sticking. Knead about 5 mins. Put into a greased bowl and cover tightly with plastic wrap. Place in a warm place and let it double in bulk. and let rise again till double. a greased cookie sheet and cover loosely with a towel and let double. breads are done. Cool thoroughly before cutting. Put mushroom stems, chopped onion and garlic in the bowl of a food processor. With several on/off turns, finely chop ingredients. Do not make into a paste. Heat olive oil in a large pan over medium heat. Add stems, onion and garlic and sautÃ© until onion is soft. Add wine and cook until all liquid evaporates. Remove from heat and stir in the breadcrumbs. Cool. Put chopped artichoke in bowl of clean food processor. With several on/off turns, finely chop. Do not make a paste. Remove to a bowl and add scallions, Parmesan cheese, mayonnaise, salt and pepper. Stir to blend. Add sautÃ©ed onion mixture to the artichoke mixture; stir to combine well. Heat oven to 350 for 10 minutes. Spoon 1 heaping teaspoon of artichoke/onion mixture into mushroom caps. Place on lightly greased, or parchment-lined, cookie sheet. Bake at 350 for 12 to 15 minutes or until golden brown. 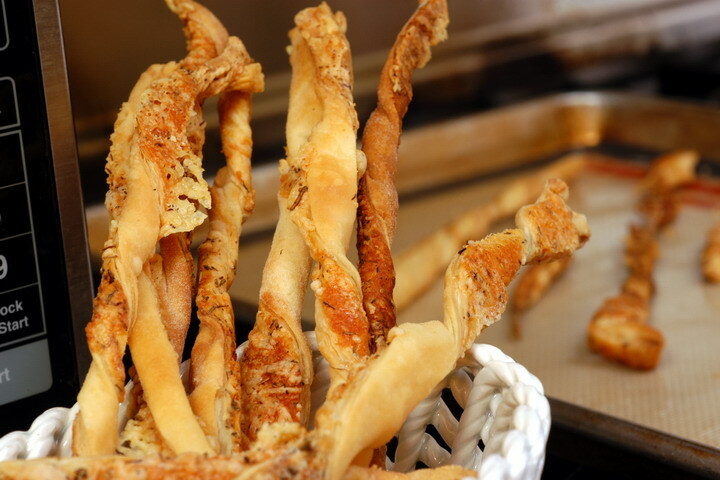 Roll out puff pastry on a lightly floured surface to about 10″ x 12″. Beat the egg with 1 tbsp water and brush the surface of the pastry. Sprinkle each sheet with 1/4 cup of parmesan and 1/2 cup of gruyere and 1/2 tsp of thyme. Sprinkle with salt and pepper. Using a rolling pin, lightly roll the ingredients into the dough to adhere. With a sharp knife or a pastry cutter, cut each sheet into 11 or 12 strips. Twist each strip and place on sheet that has been lined with parchment or silpat. Bake for 10-15 minutes until lightly browned and puffed. Turn each strip and bake for another 2 minutes. Don’t overbake as these will burn. Whisk mayo, lemon juice, garlic, cayenne and mustard in a bowl. This is best made one day in advance. Heat oil to 375 degrees. Mix cornmeal, salt and 1/2 tsp cayenne in a bowl. Toss to coat well. 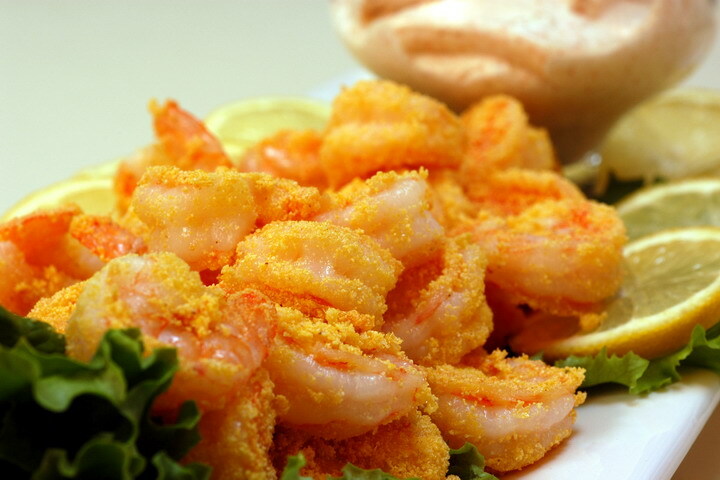 Working in batches, fry shrimp for about 1-1/2 minutes. Drain and serve with aioli. Thaw pastry sheet at room temperature for 30 minutes. Preheat oven to 400 degrees. Mix egg and a tsp of cold water. 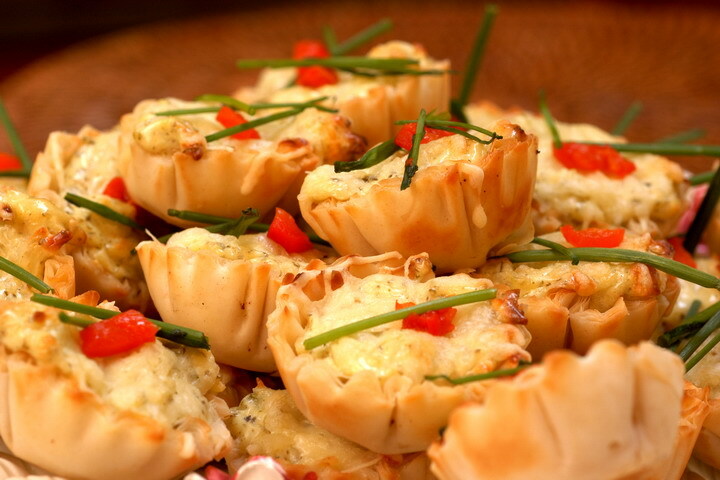 Mix together all the ingredients except puff pastry and egg. Unfold pastry on lightly floured surface. Roll into 16â€x12â€ rectangle. 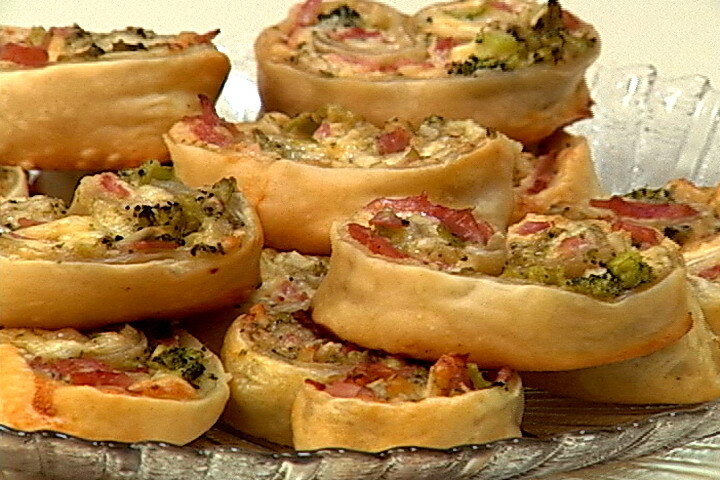 Spread ham and cheese and broccoli mixture on top of the rolled out pastry to within 1/2â€ of edges. Starting at long side, roll up like a jellyroll, ONLY to the CENTER. Roll up opposite side to the CENTER to meet the other roll. Brush between the rolls with egg mixture and top. Gently press the rolls together. Cut into 32 (1/2â€) slices. Place on greased baking sheet. Bake 15 minutes or until golden. Serve warm or at room temperature. Makes 32 appetizers. TIP: To make ahead, place slices on baking sheet and brush with the egg mixture. Freeze. When frozen, store in plastic bag up to 1 month. To bake, preheat oven to 400 degrees. Place frozen slices on baking sheet and bake 20 minutes or until golden. Heat oven to 375 degrees. Line cookie sheet with parchment or silpat. In a medium bowl, beat cream cheese and egg. Stir in 1/2 cup swiss cheese, then the pesto and the green onions. 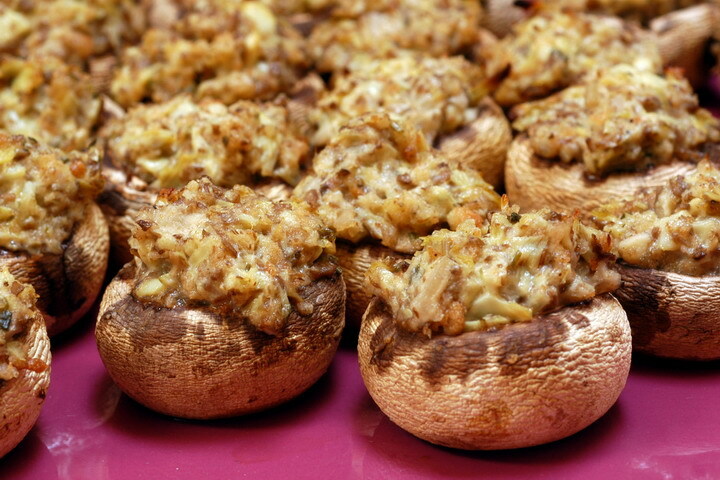 Fill shells with slightly less than 1 tbsp of the cheese mixture. Sprinkle with a bit of the shredded swiss. Bake 20-25 minutes or until cups begin to turn golden and are slightly puffed. Serve warm. Sauce: Combine mustard and vinegar in a small sauce pan and allow to set at room temperature for 4 hours. Stir in sugar and egg yolk. Cook over low to medium heat until thick. Cool. Refrigerate until ready to serve. 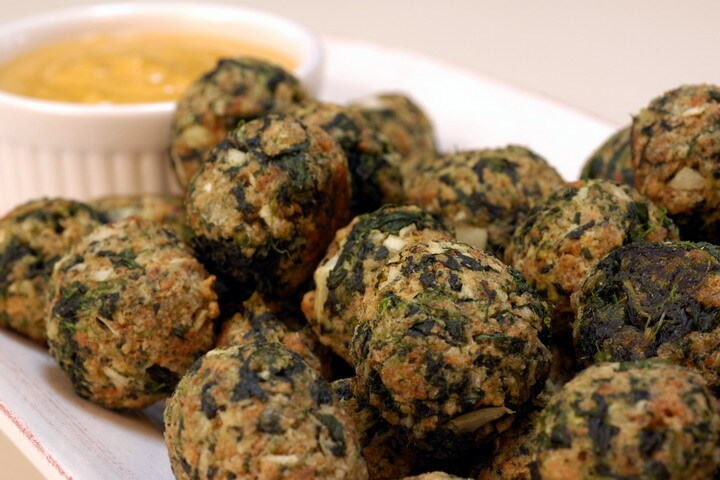 Spinach Balls: Heat oven to 350 for 10 minutes. Mix all of the first 7 ingredients until well combined. Form into small balls and place on a greased (or parchment-lined) cookie sheet. Bake at 350 for 10 – 12 minutes. Mix all 3 ingredients together well in a small bowl. Place in a airtight container. Store in cupboard. Makes 3/4 cup. Cream butter and cream cheese. Add sugar and beat until fluffy. Add 1 egg at a time, beating well after each. Gradually add flour and salt. Add vanilla and mix well. Pour into greased and floured pans. Bake at 325 degrees. Mix all of the above by hand until moistened and feels like wet beach sand. 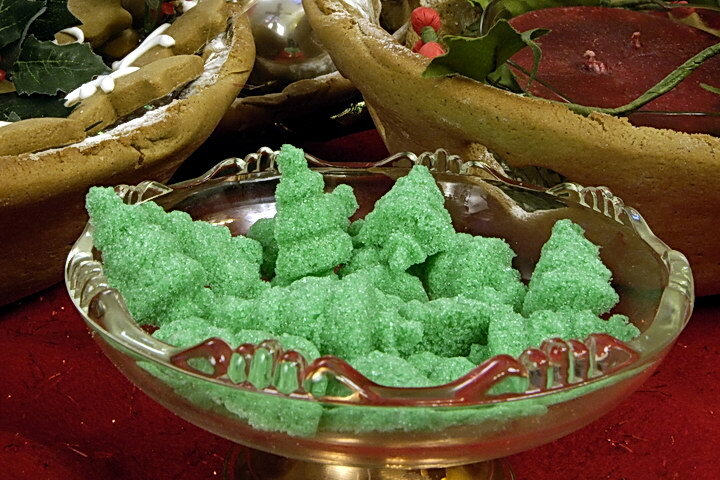 Pack the sugar mixture into candy molds of your choice, pressing firmly into the mold. Remove excess with a straight edge spatula or the back of a butter knife. Place a piece of cardboard over the mold and turn over to remove shapes. Let dry at room temperature for at least 5 hours – or – place in a 200 degree oven for 10 minutes. Cream the butter and sugars until fluffy, about 1 minutes. Add the molasses, corn syrup, vanilla and eggs, one at a time, beating until the mixture is well combined. In another bowl, combine all of the dry ingredients. Add the flour mixture to the butter mixture. You may need to either finish the dough by kneading by hand or divide into two portions and combine each half well in the mixer. Wrap in plastic and chill for about an hour. Cover the outisde of a 1-1/2 qt. ovenproof bowl with aluminum foil, making sure the foil is tucked into the inside of the bowl. Spray the foil with cooking spray and set aside. On a flour surface, roll 1/2 of the dough into a circle, approximately 1/4″ thick. Immediately lift and and press onto the bowl, molding it firmly to the shape of the bowl. Trim the edge away. 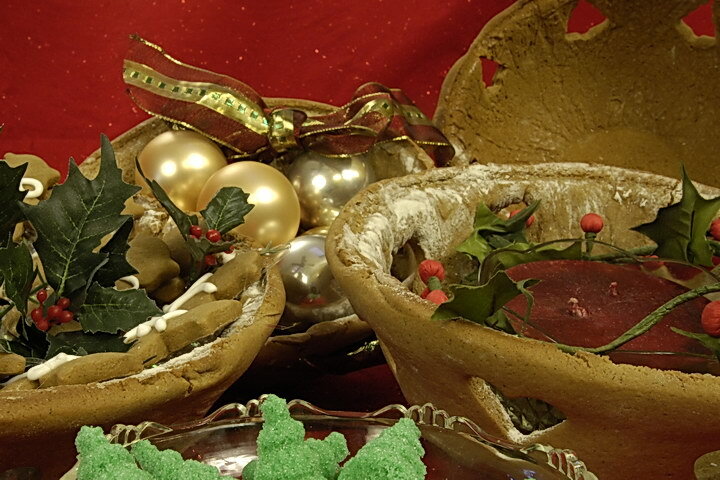 Then using a small cookie cutter, make decorative cuts into the rim of the bowl, not too near the edge. Chill the bowl for at least one hour, or freeze for 1/2 hour. Bake in a preheated 350 degree oven for about 20-30 minutes, or until set. Allow the bowl to cool completely on the bowl. When completely cooled, turn over and remove the bowl first and then the aluminum foil. Note: You could mix up some royal icing and decorate the outside of the bowl as well. Measure sugar into small bowl. Sift cocoa, cinnamon and coffee granules into sugar. Spoon into plastic bag or jar with tight fitting lid. Makes about 1 cup. Heat 1 cup milk in a large mug in microwave on high for a bout 2 minutes until VERY hot. 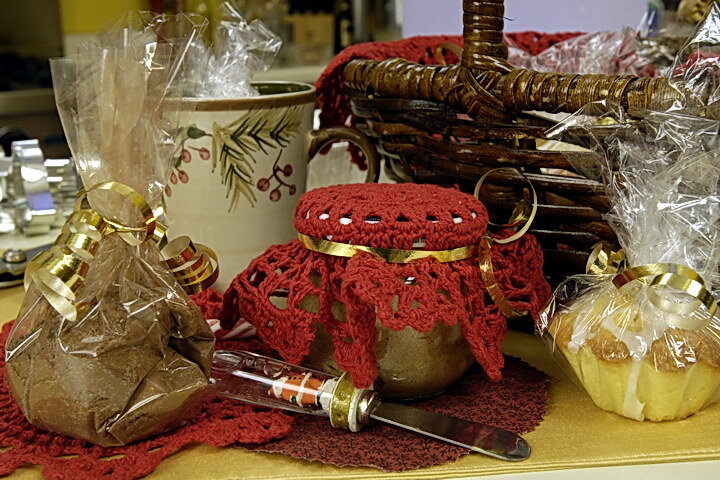 Add 1-1/2 tablespoons Hot Cocoa Coffee Mix. Stir. Serves 1.